The brother of Ivory Coast striker Didier Drogba is set to follow in the footsteps of his famous sibling and sign a contract with French Ligue 1 side Le Mans. Freddy Drogba, 14, is in talks with Le Mans officials over a deal after impressing on trials with the club last week. Le Mans are looking to tie the youngster to the club, and said: "We are in discussion with him but he is still to sign anything, although that could happen very quickly." The club added: "He is a striker in the same mould as his brother." 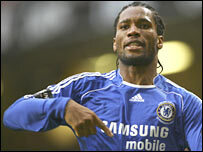 Didier Drogba played for Le Mans from 1997 to 2001, before moving to Guingamp and then Marseille. "I told him if you want to try to be a footballer, go to Le Mans," said Drogba, whose brother is currently with an amateur side in Paris. "You will have to work hard but it's for your own good." The Ivory Coast international completed a US$48m switch to Chelsea in 2004, and has since established himself as one of the world's leading strikers.